Southern Illinois University Edwardsville Upward Bound students were encouraged to pursue promising career paths, while focusing on character development at two separate conferences, each targeted for males and females. 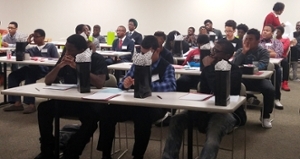 On April 30, the SIUE East St. Louis Center’s Upward Bound Program hosted a Victory Young Men’s Empowerment Conference and a Flawless Young Ladies Conference. “The purpose of the conferences was to further equip, encourage and empower our young men and women for success in school, college, careers and life,” said Javonda Quinn, director of the ESLC’s Upward Bound EC and BEM programs. Upward Bound (UB) helps youth prepare for higher education. Participants receive instruction in literature, composition, mathematics and science on college campuses after school, on Saturdays and during the summer. UB serves students from the following high schools: East St. Louis and Cahokia (EC) and Brooklyn, East St. Louis Charter and Madison (BEM). Naeem Ahmad Whitaker, CEO of the Imani Learning Center and life insurance producer with American Income Life, was the keynote speaker for the first annual Victory conference. Whitaker challenged the young men to achieve their personal victory. Whitaker, of St. Louis, has a bachelor’s in business, and a master’s in management and leadership from Webster University. The Victory conference included a Career Journey forum, workshops and group panelists. Panelists on the Victory Career Journey included Steven Boyd, UB alum and technical support analyst with Century Link; Johnathan Tate, faculty associate with SIUE East St. Louis Charter High School (CHS); Darron Suggs, youth account manager/job developer at the Father Support Center; Barry Silva, client support technician with SIUE Informational Technology Services; and Untress Quinn, partner with Hinshaw & Culberton, LLP. Tandra Stewart-Clark, Southern Regional Clinical Coordinator with the Illinois Department of Children and Family Services, was the guest speaker for the Flawless Young Ladies Conference. The Flawless Conference also held a Career Journey forum, workshops and group panelists. Some of the Career Journey panelists included: Erica Becton, human resources generalist at Airport Terminal Services in St. Louis; Berakiah Boone, master’s in education and music specialist/educator with St. Louis Premier Academy; Regina Everett, and Jacqueline Kemp, PhD, astronomer and SIUE postdoctoral fellow. Upward Bound parents also received instruction at the Victory and Flawless conferences. “I wanted to provide an opportunity to support the parents of the students we serve by providing them with an empowerment workshop that gave them helpful resources in supporting their children in education and in life,” said Quinn. 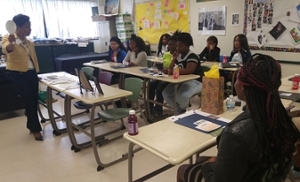 The SIUE Upward Bound Flawless Conference featured various workshops for young women. The SIUE Upward Bound Victory Conference featured various workshops for young men. 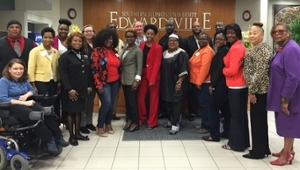 Shown are a group of presenters from the SIUE Upward Bound Victory and Flawless conferences at the East St. Louis Higher Education Campus.